Sets the new vertical position of the given graphic item. The current vertical position can be obtained through the WaveformAnalyzer.GraphicItemVertPositionGet method. For details about graphic items management on the waveform analyzer refer to the How to add graphic items to the Waveform analyzer section. Unique identification number assigned to the graphic item. The new vertical position of the line expressed in percentage of wave amplitude. May assume values from -100 to 100: a negative value indicates that the line should be drawn over negative waveform peaks. 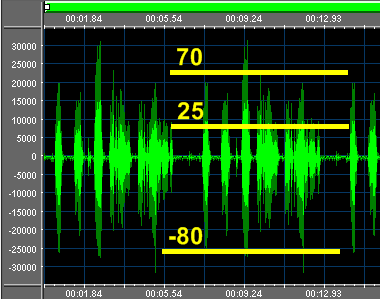 On the screenshot below you can see 3 lines, 2 on positive waveform peaks, respectively at 70% and 25% of the waveform amplitude, and one on negative waveform peaks at -80% of the waveform amplitude.